Valentin`s areas of specialization are: Litigation, civil law, intellectual property law, private international law, business and corporate law. Taras Shevchenko National University of Kyiv, 2010, Master of Law (Honours). Taras Shevchenko National University of Kyiv, 2008, Bachelor of Law (Honours). – The monograph «Contractual legal relations in the field of the copyright law of Ukraine». – Co-author of the monograph «Responsibility in Private Law», ed. Bezkluby I., Kuznetsova N., Maydanyk R. etc. (The series «About the Ukrainian Law»). – Scientific-practical conference: «Human Rights in healthcare: problems of doctrine and practice» (Kyiv, Taras Shevchenko National University of Kyiv, 24 September 2013). 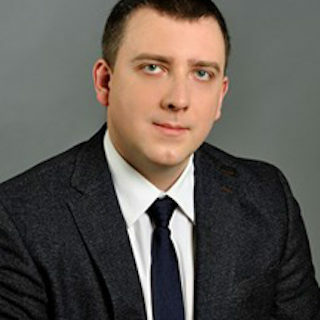 Valentin Bazhanov was a judge at an International tournament of mediation «Kyiv Mediation Tournament» (21-23 November 2013, Kyiv, Taras Shevchenko National University of Kyiv). PhD Thesis: «Contractual legal relations in the field of the copyright law of Ukraine».